Since the U.S. invasion of Iraq, by one widely reported estimate, as many as 655,000 Iraqis have been killed, in air strikes, by bombs, in death-squad executions and generalized civil strife. Now, add one by hanging: the kangaroo-court trial and execution of Saddam Hussein. In life, even in prison, he inspired many loyalists to fight for his legacy; but his death is certain to spark even fiercer violence, not just from his remaining lieutenants and senior Baath party officials but throughout the broader Sunni Arab community in Iraq. It pushes any hope of Sunni-Shiite reconciliation farther away, inflames passions on both sides and solidifies the image of the United States in Iraq as a bloodthirsty occupier. Convicted of war crimes by a puppet Iraqi regime that dispensed with niceties such as evidence and rebuttal, Saddam Hussein was blamed by his fiercest critics — such as Kanan Makiya, author of "Republic of Fear," and others with strong motive to inflate the scale of Saddam's crimes — of killing 300,000 Iraqis during his 35-year rule (1968-2003). In less than four years, George W. Bush has more than doubled that, with no end in sight. As war criminals go, Bush wins hands down. The 655,000 U.S. victims in Iraq do not include the hundreds of thousands of Iraqis, mostly children, who died during a 12-year era of U.S.-imposed sanctions on Iraq from 1991 to 2003, but those deaths, at least, were obscured by a fig leaf of legality, since the sanctions had been approved by the U.N. Security Council. Bush's Iraq War had no such cover: It was deemed "illegal" by Kofi Annan, the former U.N. Secretary-General. In a statement written in advance of Saddam's hanging, Bush warned that his death "will not end the violence in Iraq" — truer words have not been spoken. No longer Iraq's ruler, since his capture Saddam had become a symbol of the power struggle between the Shiite Arab religious parties that have come to rule parts of Baghdad and southern Iraq and the growing, Sunni-led resistance army that controls most of several provinces to the north and west of the capital, along with significant swaths of western Baghdad. His death will, of course, inspire the religious Shiites into intensifying their jihad, cementing their belief in the righteousness of their cause. Far more important, however, it will spark a burning desire for revenge among the Sunni Arabs, and not just among Baath party veterans. The commanders and organizers of the insurgency are primarily drawn from those veterans and from the former Iraqi army officer corps, who were mostly Sunni. But their base is among the tribes and clans of western, Sunni Iraq — and since the U.S. invasion, the sons of those tribes have been increasingly enlisting in the resistance army, often to the dismay of some of the more conservative tribal elders. An overwhelming majority of the Sunni Arab population of Iraq now supports the resistance, and its intensity is likely to grow significantly in the wake of Saddam's death. 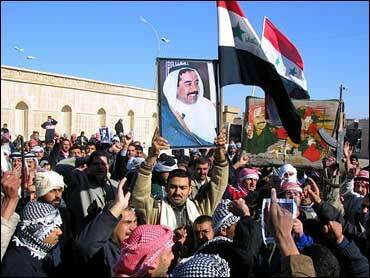 Earlier this year, 300 Sunni tribal leaders met in Anbar to issue a demand that Saddam Hussein be released from prison, just one indication that support for the former president of Iraq was widespread. "The execution of Saddam means that the flame of vengeance will be ignited and it will hurt the body of Iraq with unrecoverable wound," a Sunni tribal leader told The New York Times. Indeed, despite the talk of a surge of U.S. forces to pacify the Iraqi capital, the fiercest fighting in Iraq is north and west of Baghdad, in the heart of Sunni Iraq. On December 24, the US military command announced the deaths of three more Marines and two more soldiers there, bringing the total for December to 108 Americans dead and making the month the bloodiest of 2006. At least a year ago, the U.S. military determined that the war in Sunni Iraq was lost militarily, and that it could only be resolved through a political deal between Sunnis, Shiites and Kurds. Now, the United States faces a stark choice: Either abandon Anbar altogether, or face a years-long counterinsurgency campaign there that will mean Fallujah-style, house-to-house fighting in dozens of cities and towns. A political accord for national reconciliation, always an iffy proposition, is now even more difficult to achieve, in the wake of Saddam's execution. The Shiite religious bloc, were it not intent on an all-out victory that humiliates the Sunni community, might have held out a life sentence for Saddam as part of a deal that included amnesty for insurgents, the cancellation of the draconian de-Baathification laws, the reconstitution of the army and a power-sharing formula that includes Iraq's oil wealth. Now that bargaining chip —and it is a major one — is lost. And something else is lost. Since his capture in 2003, Saddam has been interrogated by U.S. officials, including CIA officers. According to sources close to the resistance, U.S. officials — including Secretary of State Condoleezza Rice and former Secretary of State Donald Rumsfeld — met with Saddam Hussein earlier this year, to ask if he would cooperate in some way to urge the resistance to lay down its arms. (He refused.) But whatever transpired between U.S. officials and Saddam since he was captured, none of it is public. Not a single journalist interviewed Saddam. As far as we know, he wrote no memoir in prison. The countless secrets that he had, about 35 years of his leadership, he has taken to the grave. Decades of history have been lost, irrecoverably. Perhaps one of the reasons for the hurried rush to the gallows, even before a series of other staged, show trials could be arranged, was to make guarantee that Saddam's secrets never see the light of day.